An asbestos survey in Grimsby is a step towards a healthy living space. Asbestos was the magic mineral of the 20th century. It had numerous unique properties that made it favourable for both domestic and commercial use. Asbestos is a naturally occurring silicate mineral. It occurs in different colours ranging from brown and blue to white and green. The mineral has long thin fibrous crystals composed of millions of microscopic fibrils. Slight abrasion is enough to release the fibrils into the air. Although asbestos has been exploited by humans for centuries, large-scale mining began in the late 19th century. The extensive mining was as a result of the increased demand from manufacturers and builders. Despite having numerous benefits, asbestos can be a health hazard if not used carefully. 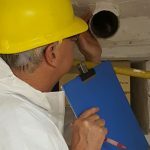 In Grimsby, asbestos survey assesses and eliminates the risk of asbestos-related health conditions. Asbestos was a popular raw material for builders and manufacturers. The mineral was mixed with concrete to improve the tensile strength. Moreover, the mineral was used for soundproofing and building insulation. Manufacturers of electrical appliances also used the mineral for electrical insulation. Unlike other raw materials, asbestos is cheap. This translates to low production costs. Following public awareness of the health implications of asbestos, its use drastically reduced in the late 20th century. In some countries, the mineral was outlawed from use in mainstream insulation and fireproofing of buildings. Despite the prohibition, many buildings constructed in the late 20th century still stand as apartment buildings and business premises. ACS specialises in providing a first rate asbestos survey in Grimsby. We have the latest cutting-edge technology to assess your living and business premises for asbestos. We are experts at handling and disposing asbestos. A thorough survey is mandatory to guarantee a healthy living space. Asbestos fibrils are unknowingly inhaled and deposited in the lungs. The fibrils have been linked to malignant changes in lung tissues. Mesotheliomas and other lung cancers are the probable outcomes of asbestos exposure. Contact us today and secure a safe living space. We offer quality services at affordable prices. When it comes to asbestos, ACS is the home of quality services.